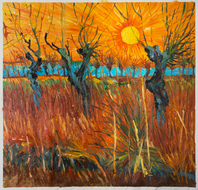 The calmness of the sunset has been captured in the most elegant way in Van Gogh’s “Landscape at Sunset”. The silhouette of the peasant girl is vaguely visible amidst the colors of the sunset. 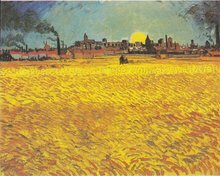 Imitating the painting style of the great Van Gogh is very tough; yet our painters have done their best to understand the techniques of Van Gogh and copied them to create replica close to the original “Landscape at Sunset”. 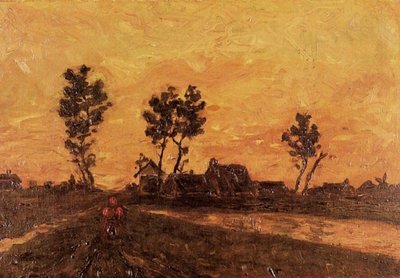 Van Gogh was in Nuenen when he painted the masterpiece, “Landscape at Sunset.” He stayed here from 1883 to 1886. He used to work outside and he was really fast with his work. He used to sketch and paint the weavers and their cottages. The arts of Millet were his inspiration, to which he added his own creative touches. 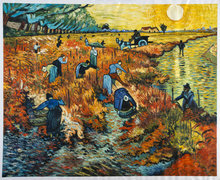 He loved to paint peasants, while they were working in the fields. This must be one of those paintings where-in he has also captured the colors of sunset. You can see the silhouette of a peasant girl, maybe working in the fields. 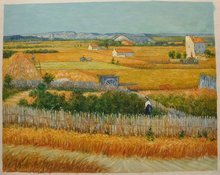 Van Gogh loved to paint landscapes of wheat fields with peasants working in them. He considered painting peasant life, a very serious job. He wanted to give people serious things to think about, through his paintings. Why accept posters or prints when you can add complexity to any room with an attractive and affordable oil painting? For example, the color orange in the painting reverberates the other colors that are found in a room’s furnishing.